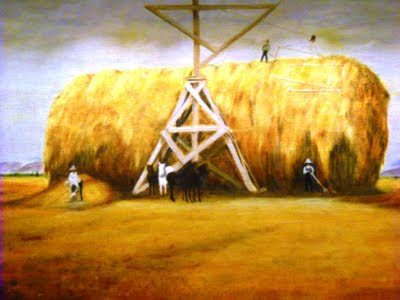 I grew up with this painting on the wall of my parent's home; a gigantic haybale constructed by my great-grandmother Rose's family on the plains of Colorado. That's her, in overalls and straw hat, on the right. The utterly practical act of cutting, stacking, and storing grass against the winter leads naturally to a sculptural intervention in the landscape on a scale to strike envy into the heart of the modern 'land artist'...who might in their fondest dreams wish for the opportunity to dot acres of shorn fields with squares and circles and bishops hats that sparkle with morning dew and stretch into shadows at sunset. Familiarity has made it invisible and mechanization has made it uniform, but I remember my farming forbears talking alot about the hay, taking pride in the quality, and the extent, and in the baling. Talk of haying still often includes tales of near-death experiences accompanied by a puffed-out chest, wild gesticulation, and nods of assent all around. Everyone knows it is difficult, and only for the strong. 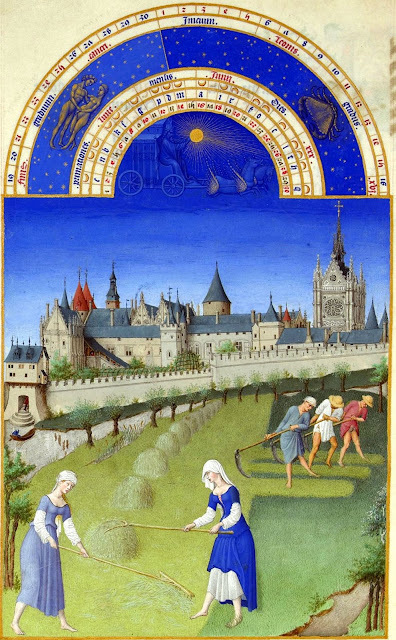 Like many vernacular landscape traditions though, hay can be ignored by historians drawn more to famous garden makers and exotic orangeries, in spite of haying's rich documentation in landscape art. And stopping at all points in between, including hay as a background to Rosalind Russel pin-ups photos and of course all of those impressionists who loved the diffused light off a haystack. 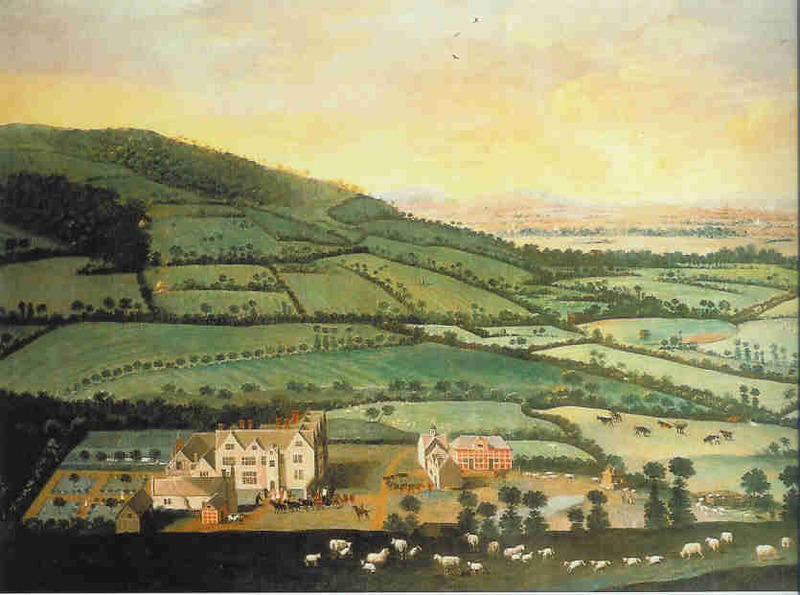 Of particular note is the essay on "Countryside around Dixton Manor", an unattributed painting c. 1715, whose panaroma of the countryside includes a comprehensive depiction of the haymaking ritual (including Morris dancers!) as conducted in the fields not far from the Cheltenham Art Museum where it now resides. 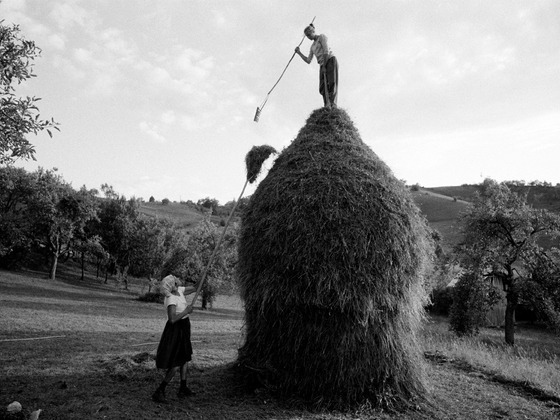 Maramures is apparently one of the only regions where hay is still treated in the medieval fashion, and is the subject of a kickstarter project by photographer Davin Ellicson to document the lives and traditions of 'Europe's Last Peasants', including haymaking (that's his photo below), before the culture is absorbed by modernity. I'm supporting it...you can do so as well at the above link. What an interesting blog post. Was the artist of the first painting one of your family members? The quality of the light in that picture is well done. Yes, my amazing Aunt Sandy painted it from a vintage photo. I will pass on the compliment! What splendid pictures. And I agree with Brent: the light in that painting _is_ amazing! I remember haying from my youth (the 50s and 60s); my part involved following the baler, small bales, and physically throwing those bales onto a truck where,either I or someone else staked them 6 high. The process was then repeated in a baking barn.The whole thing was hot and itchy and hard. Like so many processes now though, haying is less physical and more mechanical. Machines produce those huge cylindrical bales and move them. 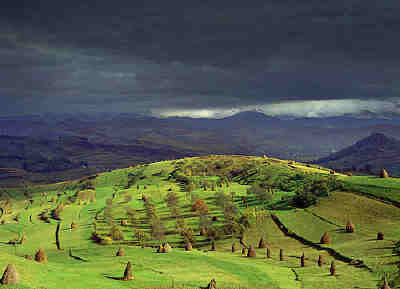 I wonder sometimes, seeing the arrangement and placement of those big bales in the fields, whether pragmatism or design motivated the farmer's movement. They are often appealing elements in the winter landscape. p.s. I notice that my verification code is butful....I hope this isn't Google's opinion of my comment?? I don't remember haying being artful in Vermont when I was a child in the '40s but can attest to the strength and vigor it took to get the job done on a hot summer afternoon. I can still feel the tickling hay stuck to my back and arms.Wonderful post. It is really surprising that I was thinking about the history of farming ! and today I found your blog ! Some of these look more like straw. In particular 1st & 3rd. Straw is yellow and leaves stubble in the field. Hay is green unless it is really poor quality. Straw is a product of grain production. Hay is grown as feed.